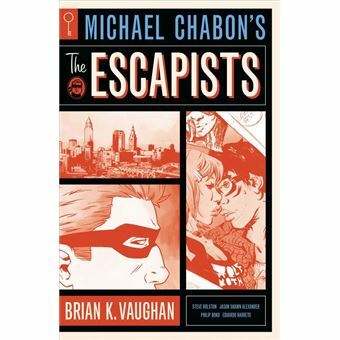 Inspired by the Pulitzer Prize-winning novel "The Amazing Adventures of Kavalier & Clay", this story of three aspiring comics creators with big dreams, small cash, and publishing rights to one forgotten Golden Age hero -The Escapist - is Brian K. Vaughan's love letter to his chosen medium. The lives of these creators Max, Denny, and Case - latter day versions of Joe Kavalier and Sam Clay - are brilliantly woven together with the world of their creations. Inspired by the Pulitzer Prize-winning novel The Amazing Adventures of Kavalier & Clay, this story of three aspiring comics creators with big dreams, small cash, and publishing rights to one forgotten Golden Age hero--The Escapist--is Brian K. Vaughan's love letter to his chosen medium. The lives of these creators Max, Denny, and Case--latter day versions of Joe Kavalier and Sam Clay--are brilliantly woven together with the world of their creations. Discovering his late father's decades-spanning vault of Escapist memorabilia at the age of six, Max became a fan of the Master of Elusion almost overnight. After exhausting the extensive stash of Golden and Silver Age comics, he needed more--and started writing his own Escapist stories. Now nineteen, he's determined to make the character a sensation once again. Together with his friend Denny Jones, and their newfound artist Case Weaver, Max relaunches The Escapist comics. Through a couple risky publicity stunts--including one that makes national news--the creators risk criminal charges to get the word out about their publication. Will it be enough to make the book a success? Or just enough to get them in jail? Interwoven with Max's struggles are the comic-within-a-comic stories of The Escapist himself, his ally Luna Moth, good old-fashioned death traps, betrayal, and a touch of romance. Mulitiple award-winning author Brian K. Vaughan (Saga, Y--The Last Man, Ex Machina) successfully crafts the perfect partner to Michael Chabon's masterpiece. Brian K. Vaughan Pia Guerra José Marzán Jr.